Turning 30 can be a daunting experience for a woman. Help her embrace and celebrate this wonderful milestone with this thoughtful bday bracelet. Let her know that she is appreciated and loved. This is just the beginning of a whole new chapter in life. 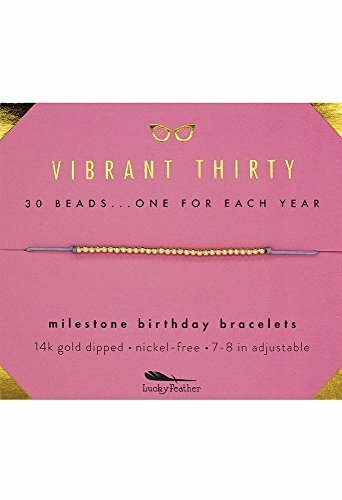 Mark the occasion for your wife, daughter, friend or girlfriend with the Lucky Feather Vibrant Thirty Bracelet, featuring 30 dainty 14K gold-dipped beads - one to represent each magical year of life. Threaded on a simple cord, this fashion-forward bracelet is destined to become her favorite fashion accessory with jeans and t-shirt, business casual attire or stunning dress. A larger gold bead functions as a sliding toggle, keeping the bracelet on her wrist so that it remains a cherished keepsake for years to come. The toggle closure also allows the recipient to obtain just the right fit, as it adjusts the bracelet from 7" to 8" to accommodate most wrist sizes. We use only the highest quality nickel-free materials so this bracelet is suitable for even the most sensitive skin. This is the gift that she'll return to again and again, each time thinking of you with love. For a special happy 30th birthday gift that she will always treasure, add the Lucky Feather 30th Milestone Birthday Bracelet to your cart today. COMMEMORATE her turning fabulous forty with this milestone Birthday bracelet with 30 dainty 14K gold-dipped beads. DELICATE beaded strand lends an elegant yet subdued touch to any party ensemble. Sure to be treasured 30 year old birthday gifts. ADJUSTABLE CORD extends from 7" to 8" to accommodate most women's wrist sizes. NICKEL-FREE design is gentle and non-reactive on sensitive skin. A perfect gift idea for mom, wife, daughter, sister, niece, friend, girlfriend, mother. SLIDING TOGGLE provides a reliable closure and custom fit for the Birthday girl's comfort. If you have any questions about this product by Lucky Feather, contact us by completing and submitting the form below. If you are looking for a specif part number, please include it with your message.